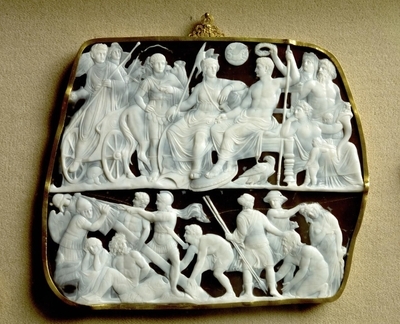 The Gemma Augustea, the finest and almost the largest cameo that survives from antiquity, celebrates Augustus and Roman triumph. Caesar Augustus (63 B.C.-A.D. 14), the founder and great expansionist of the Roman Empire, the architect of the Pax Romana, the creator of a golden economic age, the instigator of grand civic structures, was also an eminent patron of the arts. In the years leading up to his death, he—or a supporter, perhaps?—commissioned a magnificent cameo glorifying his deeds. It is surely the finest and almost the largest cameo that survives from antiquity. Known as the Gemma Augustea, it tells a story that unfolds in two frieze-like registers. 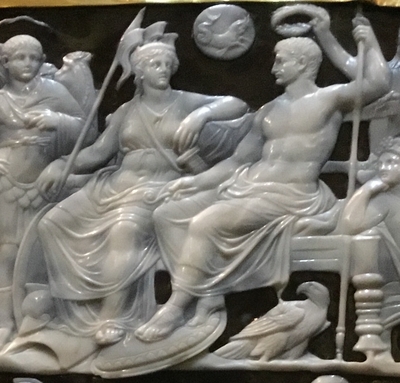 In the upper level, Roma, the goddess of Rome, sits at the center on her throne in a relaxed pose, her eyes meeting those of Augustus, enthroned just to the right. Their knees almost touch. Augustus, his chiseled face in profile and his muscled body naked from the waist up, holds in his right hand a lituus, a crooked wand used by augurs for divination. Behind him is Oikoumene, a goddess who personified the civilized world, about to place a military wreath known as a corona civica on his head. Below his throne is an eagle, symbol of Jupiter, touched by the hem of Augustus' garment. Further to the right are Tellus Italiae, a goddess personifying Italy in all its fecundity, who holds a cornucopia, and Oceanus, god of the sea. The left half of the upper register carries a different but equally potent message. Near the edge is Tiberius, the stepson Augustus adopted as his heir. Holding a staff, he has arrived in a chariot with none other than winged Victory, but is now alighting, as if encouraged by her to move on to the next military challenge. To the right is Germanicus, the nephew Tiberius adopted as his heir at the behest of Augustus, in military dress. Here Augustus is setting forth his plans for a dynasty that will wage war to expand the Roman realm and extend the prosperity he engineered. These vivid tableaux—playing out in low white relief against a bluish-black background—are brilliantly executed. The idealized figures are crisply carved in minute detail: delineated feathers on the eagle; muscles, bones, hair curls and toenails on the figures, and irises in the eyes of Augustus and others. The draped garments are delicately diaphanous. Yet the sardonyx into which all this was carved is about a half-inch thick. In Rome at that time, such a fine cameo could have been made only by the Greek master carver Dioskourides (active late first century B.C. ), a favorite of Augustus who created his personal seal, or (more likely, given the date) by one of his sons or disciples. 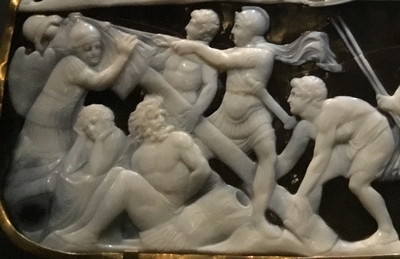 Testament to the Gemma's superiority is clearly on view at Vienna's Kunsthistorisches Museum, where it hangs in its own vitrine in a gallery filled with other ancient cameos. They do not compare in quality, nor can the one known larger ancient Roman cameo, the 12.2 inch by 10.5 inch Grand Camée de France, created at least a decade later in the first century. The Gemma, now about 7½ by 9 inches, was originally larger, too, judging by its irregular shape and such features as Tiberius' extended right arm, which seems to reach out to another figure. It was, scholars have posited, probably owned by Augustus or his family and conceived as a private work of art—to be shown to friends at small events. Its edges were probably chipped away as it was handled and transported. And it did travel. For more than a millennium, the Gemma's whereabouts is unknown, though various theorists place it in Constantinople, then returned to the West by crusaders. In the mid-13th century, it resurfaces in an ecclesiastical inventory in Toulouse, France. In 1533, Francis I has it at Fontainebleau, but it disappears from written record again until around 1600, when it reappears in Venice. There it was purchased by the Habsburg Holy Roman Emperor Rudolph II for 12,000 golden ducats, becoming part of the Imperial collection. It came to the Kunsthistorisches Museum when it opened in 1891, and has been delighting visitors ever since.